Click on graphics for more views and details. 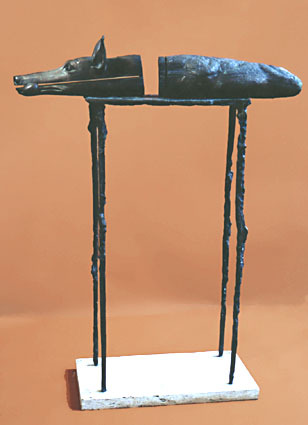 A dog strains to balance on the edges of a burning table, and below bronze flames lick the air. How do we come to terms with the precariousness of mortal life? 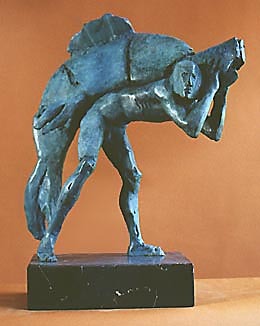 A man struggles to carry a huge fish, conflating the mythological symbols of Atlas carrying the burden of the world, the biblical narrative of Jonah as a symbol of resurrection, and the natural history vision of mammals evolving out of fish. 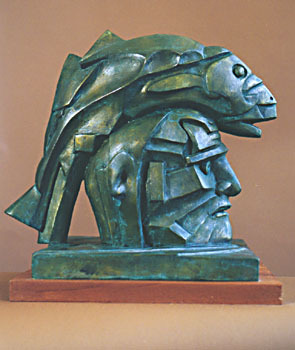 A minimal, more abstract rendering of the same idea. From one view, a famished dog clenching a knife in its teeth-- from another, a combined loaf and fish. This subtle meditation is presented on a table, like a meal. 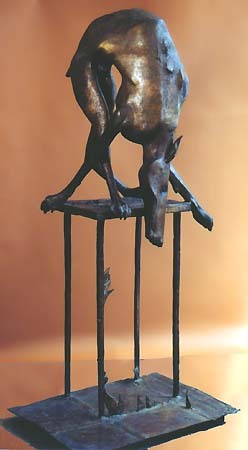 Dog on Burning Table Bronze 67x24x24"
Natural History IV Bronze 20x18x10"
Natural History III Bronze 12x14x12"
For information on pricing and availability of these and other pieces, contact the Trust.